The Town of Longboat Key has asked the Florida Department of Transportation (FDOT) to review the latest traffic counts for the area — completed in April — as state staff proceeds with planning for a roundabout at the intersection of Gulfstream Avenue and U.S. 41 in downtown Sarasota. FDOT’s conceptual design for the roundabout was finished before the most recent data was obtained, Town Manager Dave Bullock told the Sarasota County Commission during a joint meeting of that board and the Town Commission, held Nov. 1. When County Commissioner Nancy Detert asked Bullock if he had the April figures with him, Bullock replied that he did not. Nonetheless, he told her, “They are significantly higher than the counts that we saw several years ago. … Clearly, tens of thousands of cars a day, and in season, many tens of thousands of cars a day” drive over the Ringling Bridge between Bird Key and the city of Sarasota. The peak time for that traffic, the April counts showed, is 4 to 6 p.m., and perhaps up to 7 p.m., Bullock added. 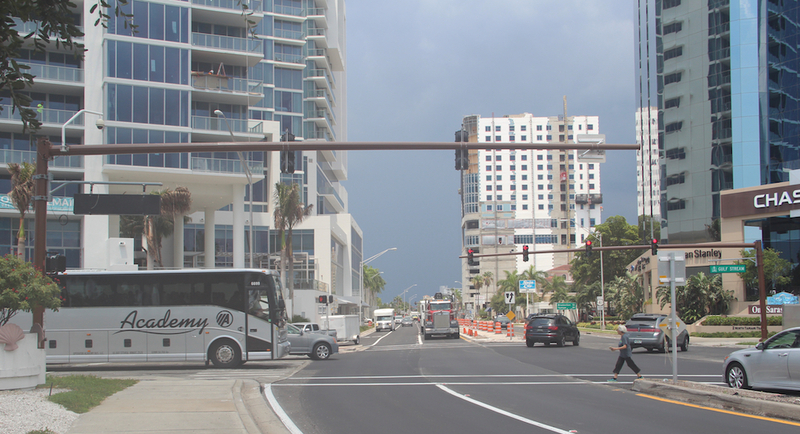 “That’s when the backup occurs between the traffic light at the U.S. 41/Gulfstream intersection and St. Armands — and even, at times, all the way to Longboat,” Bullock said. “This is not just a Longboat Key issue,” he pointed out. “This is [a concern for] all of the southern barrier islands,” as well as the City of Sarasota and Longboat Key. 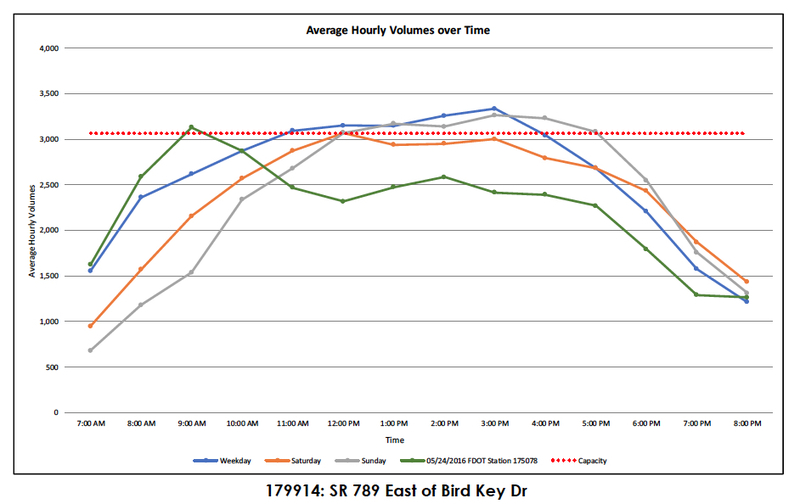 Working as a consultant to FDOT, Stantec of Sarasota released a report in August with summaries of some of the data it collected from Feb. 18 through April 19, including vehicle origin-destination traffic patterns. 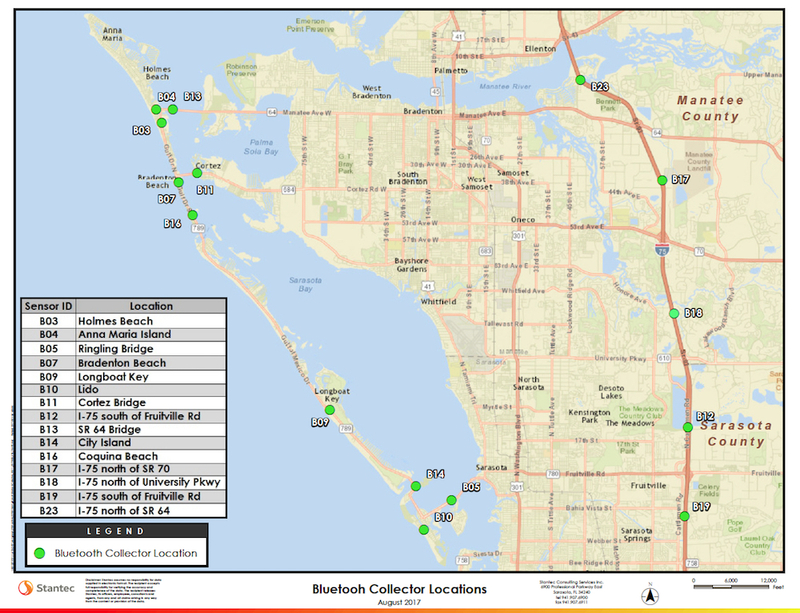 The report says that Stantec selected seven locations on the barrier islands, along with one on each bridge connecting the barrier islands to the mainland, and five locations on Interstate 75, for the collection points. “Temporary Bluetooth sensors were set up to pick up signals from smart phones, laptops, tablets, cars, and other Bluetooth-enabled devices,” the report notes, though it acknowledges that the sensors did not track every vehicle. Bullock pointed out to the county commissioners on Nov. 1 that City of Sarasota staff and the City Commission have put a focus on pedestrian and bicycle crossings in downtown Sarasota. “We understand the importance of pedestrian movement in that area, with all the development that’s occurring on the west side of [U.S.] 41,” Bullock said. 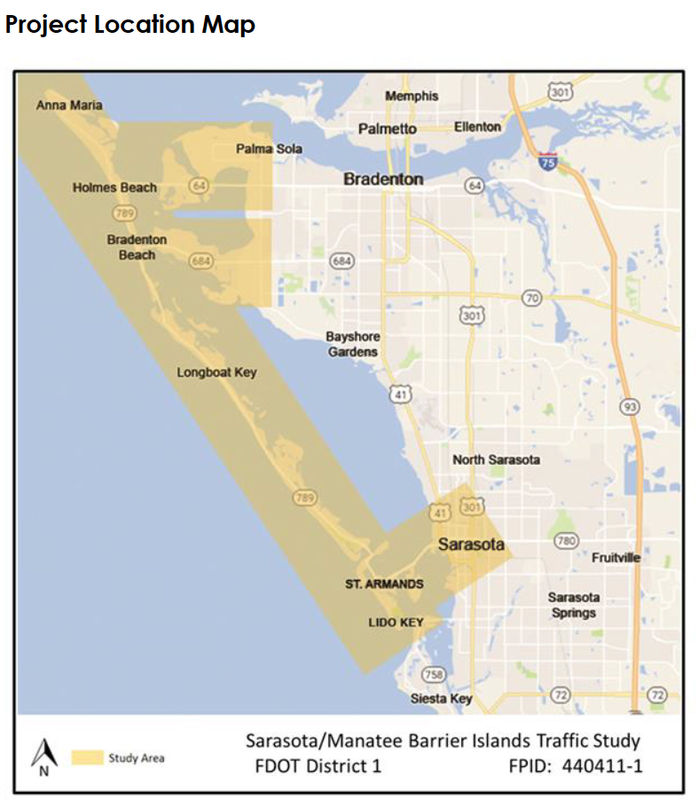 “But we also understand that U.S. 41 is a connecting road that people use to move between Sarasota and Bradenton” and between Sarasota and I-75. “We’re seeking a little better balance” of concerns for drivers, he told the County Commission. At this time, he said, the town position is not to oppose the construction of the roundabout. Town leaders have been encouraged that the Sarasota City Commission and city staff are paying more attention to the town’s concerns about traffic congestion, Gans said. That seemed evident from the commission’s unanimous approval on Aug. 21 of FDOT’s plans to create three left-turn lanes from Gulfstream Avenue onto Fruitville Road, he added. During that City Commission meeting, L.K. Nandam, FDOT’s District One secretary, and Keith Slater, traffic operations engineer for District One, showed the board members results of a study FDOT undertook of traffic flow on the U.S. 41 corridor between Gulfstream Avenue and Fruitville Road during an afternoon peak hour during the height of tourist season. “It became very apparent that [the third northbound lane on U.S. 41 is] needed,” Nandam said. During the Nov. 1 discussion, Detert asked Bullock whether everyone had given up on the prospect of a third bridge between the mainland and the northern barrier islands. Bullock and the town commissioners also took the opportunity to thank the County Commission for its support of the Barrier Islands Traffic Study, which the town requested of FDOT about two years ago. “We’re in the midst of that right now,” Bullock said. Part of the Town Commission’s approach to the study, Daly added, is to keep reminding FDOT staff that the numerous roundabouts planned for the U.S. 41 corridor in downtown Sarasota will have an effect on all the traffic that uses U.S. 41, including the drivers heading to and from the barrier islands. Thus far, Bullock noted, the study has remained in the data collection phase. (The Stantec report was part of that.) Research has shown that almost all of the traffic that moves between the city of Sarasota and Anna Maria Island is not headed to Longboat Key destinations, he added. The drivers who are not just coming and going on Longboat are reflected in “single-digit percentages,” Bullock noted. The project’s completion is estimated in the fall of 2018, FDOT says on the study’s webpage. Roundabouts improve traffic flow up to 50% plus save lives and reduces injuries! If Longboat Key officials don’t like pedestrians crossing the road maybe they can come up with the $10 Million to pay for a couple of pedestrian overpasses to improve access from downtown to the bayfront!